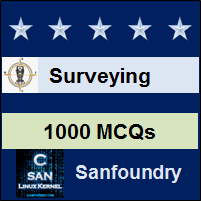 This set of Surveying Multiple Choice Questions & Answers (MCQs) focuses on “The Surveying Telescope”. 1. Surveyor’s telescope is an adaptation of Kepler’s telescope. Explanation: The surveyors telescope is an adaptation of Kepler’s telescope. It employs two convex lenses. The one nearest to the object is called the objective and the other near the eye is called eyepiece. 2. The optical principles of the surveying telescope are based on the fact that all parallel rays of light reaching a convex lens are bent when they leave it in such a manner that they intersect at a common point, called the focus. Explanation: The optical principles of the surveying telescope are based on the fact that all parallel rays of light reaching a convex lens are bent when they leave it in such a manner that they intersect at a common point, called the focus and that all the rays passing through another point called the optical centre pass through the geometric centre of lens without bending. Explanation: The surveyor’s telescope is an adaptation of Kepler’s telescope. It employs two convex lenses. The one nearest to the object is called the objective and the other near the eye is called eyepiece. 5. The object glass provides a virtual inverted image in front of the eyepiece which in turn magnifies the image to produce a real erect image in surveyors telescope. Explanation: The object glass provides a real inverted image in front of the eyepiece which, in turn, magnifies the image to produce an inverted virtual image. Explanation: The line of sight is a line which passes through the optical centre of the objective and the intersection of cross hairs. This is also called line of collimation. 7. What is the line which passes through the optical centres of objective and eye piece? Explanation: The axis of the telescope is the line which passes through the optical centres of objective and eye piece. 8. The eyepiece magnifies the cross hairs. Explanation: The cross hairs are placed in front of the eyepiece and in the plane where the real inverted image is produced by the objective. Thus, the eyepiece magnifies the cross hairs also. 9. The focal length of an objective varies with eyepiece. Explanation: The focal length of an objective is constant. Focal length is independent to the particular lens. 10. The establishment of line of sight, therefore, involves the following two essential conditions, the real image must be formed in front of the eyepiece, the plane of the image must coincide with that of the cross hairs. Explanation: The establishment of a line of sight, therefore, involves the following two essential conditions, the real image must be formed in front of the eyepiece, the plane of the image must coincide with that of the cross hairs. Explanation: For quantitative measurements, it is essential that the image should always be formed in the fixed plane in the telescope where the cross hairs are situated. The operation of forming or bringing the clear image of the object in the plane of cross hairs is known as focusing.